Honey-Can-Do GAR-03752 Adjustable garment racks. This sturdy garment rack is made from a chrome-finished, steel frame and goes from room to room on smooth rolling swivel casters, which lock in place. The hanging bars adjust to accommodate short or long garments and are perfect for managing out-of-season clothing or garments hung to dry in the laundry room. The double rotating rack doubles your storage space. Sturdily constructed to hold plenty of weight, this Commercial Garment Rack features a sleek chrome finish and 3 ft. of hanging space. Smooth, rolling swivel casters let you move the rack from room to room and lock in place easily. You can also raise the adjustable bar to accommodate longer garments, while steel shelves above and below offer ample storage space for other essentials. This rack is perfect for managing off-season clothes, outdoor gear, items to dry in the laundry room or whenever you could just use more closet space. Stackable Sweater Drying Rack (Set of 2) Honey-Can-Do DRYZ01110 Set of 2 Stackable Sweater Drying Rack, White. This stackable sweater dryer measures 28-inch x 28-inch deep and 5.75-inch tall. It is made of durable, rustproof plastic tubes which easily snap into place with plastic corner fittings. The breathable mesh netting allows ample airflow from all directions for speedy, even drying. Your sweaters will keep their shape and last longer by skipping the dryer and using a sweater drying rack. Buy several and stack them on top of each other for additional drying space. 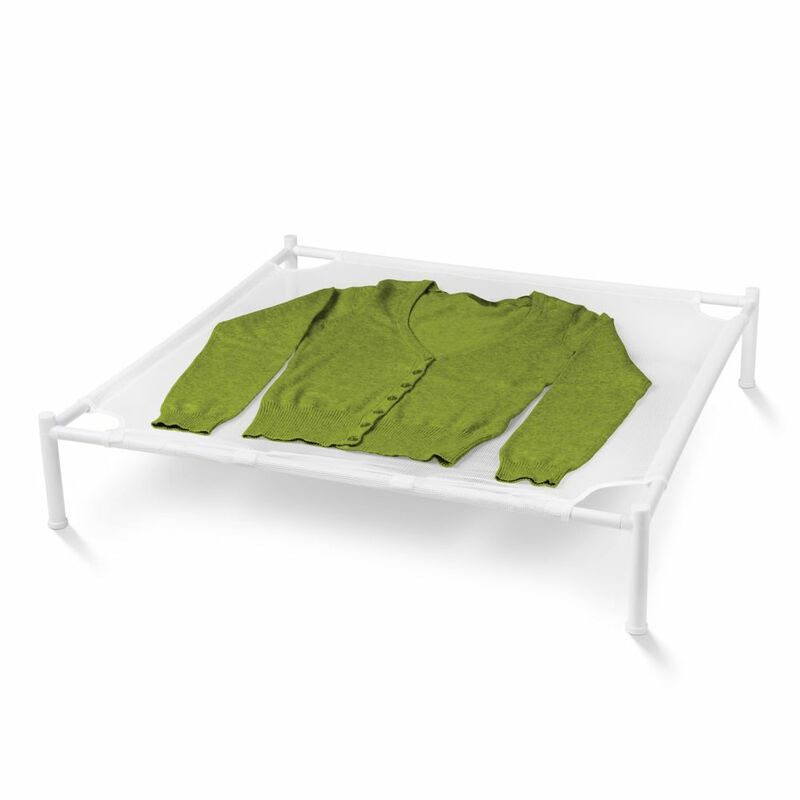 Stackable Sweater Drying Rack (Set of 2) is rated 4.7 out of 5 by 20. Rated 5 out of 5 by Cateyes from Works just like described!... Works just like described! Rated 5 out of 5 by Jb from I bought these to dry sweaters flat and they work very well. I bought these to dry sweaters flat and they work very well. Rated 5 out of 5 by Leda from Five stars! I was adding to a product that... Five stars! I was adding to a product that I already had and was thrilled to find at Home Depot! Rated 3 out of 5 by Patti from I bought these hoping they would sit nicely on top of my washer/dryer. They are too big. One of... I bought these hoping they would sit nicely on top of my washer/dryer. They are too big. One of the sides cracked while assembling.